Just three days after the first live images were published and with just four days to go until its official announcement, official press renders of Huawei’s first display hole-bearing smartphone – the Nova 4 – have leaked out online. As previously revealed, the Huawei Nova 4 features a triple-camera setup on the rear that bears a striking resemblance to the one found on the P20 Pro. However, because this is a totally different smartphone, the sensors are not the same. In fact, even all Nova 4 models don’t carry the same cameras. According to a leaked spec sheet, Huawei is preparing two Nova 4 variants. Both of these will ship with the Kirin 970 on the inside, 8GB of RAM, and 128GB of storage. They even feature the same 16-megapixel monochrome camera and 2-megapixel depth sensor. The only difference between the two is the main camera. On the cheapest model, Huawei has stuck with a 20-megapixel sensor, but on the more expensive version consumers gain access to a new 48-megapixel Sony camera. Aside from these technical differences, the two models also feature the same front panel design. Speaking of which, this boasts extremely thin bezels accompanied by a slight chin. As mentioned above, the smartphone also features a small display hole that houses the 25-megapixel selfie camera. The Huawei Nova 4 will be announced next Monday, December 17. It’s unclear when sales will commence but, as confirmed by these renders, colors will include a basic black model alongside red, blue, and white-pink gradients. 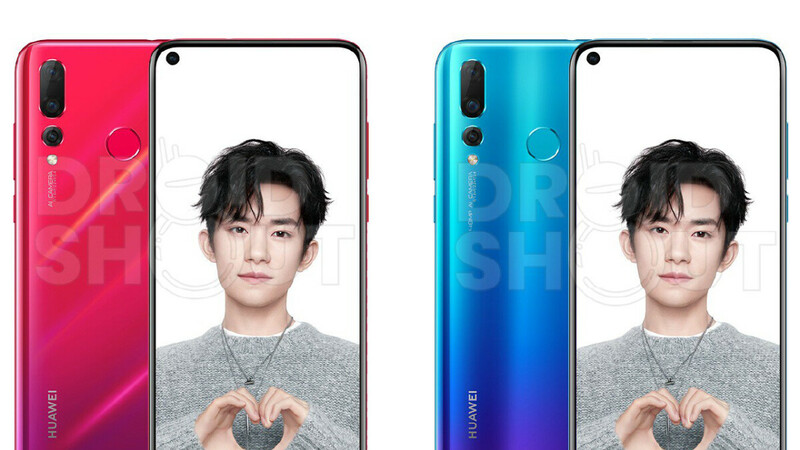 I don't think Huawei is positioning the next generation Nova smartphones to take on the S10. That would be reserved for the P30 series, especially since the Nova 4 series is launching with the Kirin 970 instead of the new Kirin 980. Looks like Huawei is positioning the Nova 4 series to be it's upper midrange flagship offerings. It will be interesting to see how these stack up against other smartphones of similar nature. I know we said that we wouldn't respond to each other again, but I'm trying to end the year with civility. Anyway, Huawei releases these smartphones with similar specs and different names for different regions. I doubt that many, if any, of the smartphone buyers outside of the techies, (not THAT Techie, lol) geeks and nerds in regions that the Nova series isn't sold is even aware of their existence. It won't confuse any prospective buyers. Going by that, the fragmentation won't have a negative impact on sales, which is all these companies really care about. Now, if you're referring to software updates, then that's a different thing altogether. Although, if the chipset is the same, I don't see why there would be an issue with the updates. Although, if we're being honest, Huawei could be better with the updates. Original design. China is the market leader in innovation.